A Turkish newspaper with close ties to President Recep Tayyip Erdoğan called for the formation of a joint Islamic army to fight Israel. Is this a fulfilment of Biblical prophecy? And those who hate You have lifted up their head. And consulted together against Your sheltered ones. The article called on the 57 member states of the OIC to form a joint “Army of Islam” to besiege and attack the state of Israel. It notes that such a joint army will greatly exceed the Israeli army in manpower, equipment and budget, and presents statistics to prove this. It also advocates establishing joint bases for the army’s ground, air and naval forces that will arrive from all over the Muslim world to besiege Israel, while noting that Pakistan, as the only nuclear country, has “a special status” among the OIC countries. An interactive map provides information on military forces stationed in various locations and the role they can play in the potential joint Muslim attack on Israel. “If the OIC member states unite and form a joint military force, it will be the largest army in the world. These countries’ total population is 1,674,526,931. The number of soldiers in active service in these countries is at least 5,206,100. Their [overall] military defence budget, of $174,728,420, is also worthy of emphasis. “As for Israel, it is significantly inferior. The population of this country, which attempted to occupy Jerusalem while surrounded by Muslim states, is 8,049,314. Note that the population of Istanbul alone exceeds 14 million. The number of soldiers in active service in the [Israeli] occupation forces is 160,000, and [Israel’s] defense budget is approximately $15,600,000,000. “The war planes that will be dispatched to the region from greater distances will be stationed in airbases [closer to Israel]. Israel will most likely to be besieged by the naval fleets that will be sent to the Mediterranean and the Red Sea. “Turkey will serve as an important headquarters during the operation, due to its land, air and naval infrastructures. The Turkish army, which carried out ‘Operation Euphrates Shield’ [in Syria in 2017] with great success, is now ranked the world’s seventh strongest army, and the second largest army among the NATO powers. Turkey has approximately 4,000 tanks and 1,000 war planes and other aircraft. Its navy made significant progress during the last years, with 194 vessels at its disposal. “As the only country which possesses nuclear weapons, Pakistan has an important status among the 57 Muslim [OIC] countries… Those who believe that they are the owners of Jerusalem today will not find a single tree to hide behind tomorrow. God has brought Trump in to support Israel at a critical time in its history. Also, Biblical prophecy tells us that we will see a Shia/Sunni battle for dominance play out before an attack on Israel and this already seems underway, as presented in recent posts. Another great teaching from Nelson Walters on the timing of the Rapture. Not date setting, but examining all the Scriptures particularly Daniel with regard to understanding the 70th week. Search the Scriptures and the Holy Spirit will reveal more of His truth to you. Jesus said, at His second coming, and before the wrath of God is poured out on the world, it will be as in the days of Noah before the flood came. People would not believe Noah until it will be too late. God’s wrath was poured out “against all ungodliness and unrighteousness of men”. “Knowing this first; that scoffers will come in the last days, walking according to their own lusts, and saying, ‘Where is the promise of His coming? For since the fathers fell asleep all things continue as they were from the beginning of creation.” What is God speaking to you to do in these last days? How many in your family and how many of your friends are facing an eternity in Hell? Are you pleading with God to use you, to do what ever is necessary to get them into the Kingdom of God? If you are interested in a Bible based synopsis of End Times signs, this is a must listen. You will need one and a half hours, but it is well worth the time. The content is comprehensive, make a note of all the Bible verses for your own study. PROPHETIC END TIMES SPEECH BY NETANYAHU AT THE U.N. I don’t believe Netanyahu understood the prophetic significance of those words nor understood how God has orchestrated the following events that he outlined. We are watching Bible “end times” prophecy unfold in our time. Listen to what Netanyahu says about Iran invading Syria, Iraq – go to YouTube and type in Netanyahu speech at UN on September 19th, 2017. The Bible tells us that Iran will invade its surrounding neighbours seeking to advance its influence in the region; “I saw the ram (Iran – Media & Persia)) pushing westward, northward, and southward, so that no animal could withstand him” Daniel 8:4. Moreover, Daniel tells us that Iran’s time of dominance is short lived as Turkey (prophesied revived Ottoman Empire) crushes Iran ” suddenly a male goat (Turkey) came from the west… then he came to the ram that had two horns… and ran at him with furious power… There was no power in the ram to withstand him… Therefore the male goat grew very great; but when he became strong, the large horn was broken, and in its place four notable ones came up… and out of one of them came a little horn (Antichrist) which grew exceedingly great toward the south, toward the east, and toward the Glorious Land… He even exalted himself as high as the Prince of the host; and by him the daily sacrifices were taken away, and the place of His sanctuary cast down” Daniel 8:5-11. Daniel clearly tells us that the Antichrist will come out of this revived Ottoman Empire. He will be their expected Messiah, the al Mahdi. Note the % of Muslims that believe the Mahdi’s return is imminent. Watch for the next prophesied events to occur, the rebuilding of the temple. We know Israel is ready, watch this one minute video by the Temple Institute. Also, watch for the two prophesied wars: Iran (Shia) pushing westward, northward and southward and then Turkey (Sunni) retaliating to reestablish its dominance (revived Ottoman Empire). In a few days, we will be celebrating the Feast of Trumpets, and Jews—along with a growing number of Christians—will gather together to observe this biblical holy day. On Rosh HaShanah, a prayer called Avinu Malkeinu (Our Father Our King) is recited. Yet His Kingship is relegated only to the His ability to forgive His people. He is much more than a forgiver; He is a redeemer and deliverer. He is strong in mighty and strong in battle. This shofar blast is not simply to call us to repentance. It is to remind us of why we are called to repentance. It is a reminder of what comes after repentance: victory. Defeat is swallowed up by victory. This, in essence, is what the sound of the shofar should do for those hearing it. For Israel, the King is coming with His army (Saints) to bring total victory against their enemy. Every year when the shofar blasts on Rosh HaShanah, their hearts are reminded that with every year that passes, the King riding upon His white horse is getting closer and closer and one day soon they will hear the Great Shofar sound and the enemy will be vanquished. For Christians, we are reminded that our King will appear with His angels in the clouds to gather the elect at the Rapture. We also get to ride with our King, to deliver Israel, and defeat the enemy. For both Israel and Christians, Rosh HaShanah is not intended to remind us of our defeats; it is intended to keep us watching for His deliverance as we are set free. The GOSPEL is as much Jesus Second Coming as it is His First Coming. There are more prophecies about Jesus Second Coming and The Day of the Lord than there were about His First Coming. The Pharisees and Sadducees did not get His First Coming and sadly the church is asleep about His Second Coming. In the Olivet Discourse Jesus tells us to WATCH and gives six signs to watch out for prior to His coming on the clouds with His angels to gather His church. We are in the “last days” when these signs are beginning to manifest. 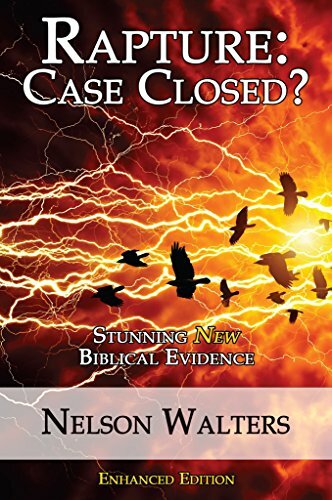 Let me give a plug for Dr Nelson Walters book Rapture case Closed? It does a great job of revealing when the Rapture will take place. A special edition of this book has just been sent free to a thousand Christian leaders in the USA in an effort to alert the church to coming prophesied tribulation. Christians will not be on earth when the wrath of God is poured out, but the big question is, when is the wrath of God poured out on the earth. Nelson shows clearly that the wrath of God is poured out in the trumpet and bowl judgements. Yes! Christians will be on earth during the tribulation and will see the Antichrist. Get the book, you will be glad you did. WHAT/WHERE IS OUR END TIMES FOCUS? If time is short, our end times focus must be on the Great Commission. This is what I like about Joel Richardson, his focus is on getting Muslims into God’s Kingdom. I met Joel at the Understanding the Times Conference in Tyler, Texas. This video will give you “his heart for the lost” as well as the role of Islam in Biblical prophecy of the last days. Alan Kurshner of Eschatos Ministries on the Prewrath Rapture. What are key passages that best represent the Prewrath Rapture position? I think the strongest passage is 2 Thessalonians 2, where Paul reassures Thessalonian believers that they are not experiencing the day of the Lord’s wrath. Paul explains that they are not experiencing the day of the Lord’s wrath because two discernible events must happen first—the revelation of Antichrist and the apostasy. Since they have not happened, Paul argues, the day of the Lord has not materialised. This passage eliminates the possibility of a Pretribulation Rapture. I also see Jesus’ Olivet Discourse as a key passage that supports the Prewrath Rapture position. It depicts all the key elements: the Antichrist’s great tribulation, cutting short of the great tribulation, celestial disturbances, Son of Man’s return to the clouds, rescue of God’s people, and the impending wrath of God. I would argue, as well, from the book of Daniel and Revelation, but the former two passages, in my view, form a strong case for the pre-wrath position. What role does Daniel 9 have in your understanding of the timing of the rapture? I do not see Daniel 9 informing a particular eschatological sequence vis-à-vis the rapture question (but I do in Daniel 11:36–12:4). There are at least two points that Daniel 9 informs us on: (1) There will be a future seven-year period during which time key events will unfold, and (2) the fulfilment of the salvation of Israel will happen when the seven-year period is complete. How does your understanding of the rapture affect your life? Jesus ominously warns believers, “See, I have told you beforehand” (Matt 24:25). This is not a cliché, but a real warning to God’s people. The great tribulation will be a concrete event occurring in the future just before the Lord returns. Jesus says it will be characterised by martyrdom, hatred, apostasy, betrayal, deception, and lawlessness. So much so that he says, “such as has not been from the beginning of the world until now, no, and never will be” (Matt 24:21). To be sure, if we do not experience this event in our lifetime, there are still important faith-principles that we can use to apply to our lives in the present time. Since God has ordained that the last generation of church will experience tribulation before she meets her Rescuer bride-groom, should this not be an urgent warning for the church? The temptation during the great tribulation to capitulate to persecution, false teaching, and slothfulness will be intense. There will be two imperative duties for the believer during the great tribulation: to overcome the adversity through faith and to encourage the fellow believer to do the same. One final implication is saliently portrayed in the angelic warning not to take the beast’s mark, lest they suffer eternal punishment in hell (see Revelation 14:9–12). God perseveres the faith of his people through concrete warnings, so it is incumbent on Christian leaders not to dismiss these eschatological warnings for their people that God has entrusted to them. So the practical implications for the basic correct interpretation are sober for the believer. This information is taken from Alan Kurshner’s book Antichrist Before the Day of the Lord: What Every Christian Needs to Know About the Return of Christ.